I hope you manage to make the most of the beautiful sunshine during the holidays and have a well-deserved break. During the final half term our topic will be ‘Minibeast Madness.’ Here we will be exploring creepy crawlies and small creatures you may find in the garden. Firstly will be learning about habitats and going on welly walks to see if we can spot some. We will be exploring how different mini beasts like diverse environments and even try to make some of our own for the garden. We will also be exploring how creatures change during their life cycles. This half term is an extremely busy one with our trip to the butterfly house on Wednesday 13th June, sports day and the transitions weeks where children will be visiting their new class so that they can get to know their new teacher and get used to the structure. This may be a little unsettling for some the children however we will do lots of circle times to try and make this as smooth as possible for both them and also you. If you have any questions about this then please don’t hesitate to ask. We are continuing with Phase 5 this half term, where more alternative sounds for phonemes already learnt will be introduced. The children have picked this up very well so far and have impressed me by asking me which spelling of the sounds they need in their writing. Please refer to the little bookmark I sent home recently for more information about this as well as to help your child consolidate these. There are still some children who are not picking up the tricky words by sight, this is very evident when reading. Please encourage them to learn as many as possible in the lead up to Year 1 as it will enable your child to access this new curriculum with a little bit more ease as new Year 1 common exception words are introduced here. Our main focus in Literacy this half term will be looking at non-fiction books once again, however we will concentrate on using the language included in such books. The children will continue to use the ‘talk 4 writing’ methods of boxing up and adding actions to help the children internalise this new vocabulary. 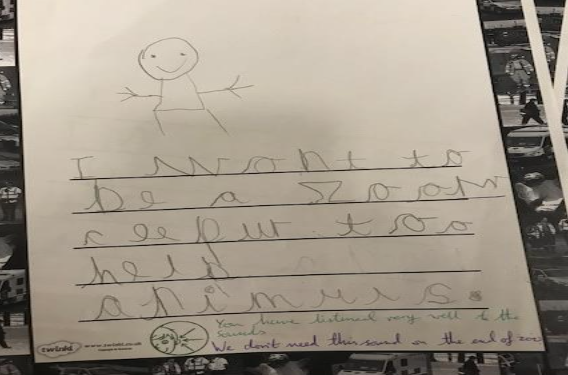 We will also be continuing to encourage children to write sentences independently and have a focus on handwriting to get letters clearly formed ready for their next school year. Some children are continuing to need lots of support when writing. Please can I ask that you encourage as much independence as possible when completing their home learning tasks. If they constantly ask you what sound is next, re-direct the question to them and don’t fall into the trap of accidently giving them all the answers. This will help them greatly. Also once your child has done some writing, if you ask them to read over their work, this will encourage them to evaluate their work and add in anything they realise they have missed. This will once again help make the transition into year 1 far easier. We have returned to school learning all about Money, here we will be learning how to recognise and identify coins using their size, shape and colour, before looking into the concept of value. We will then move on to time. When looking at time we will begin with learning the days of the week and months of the year, before using different methods to measure time, such as stop watches, sand timers and then clocks. Ask children to sort a pile of coins into 1ps, 2ps 5ps etc to help them learn the properties of the money. Set up a pretend shop. Allow them to hand over coins when in shops and look at price tags when you are out. Put coins in a bag, ask children to close their eyes and choose one and then they have to tell you what it is. You could then have a turn and get it wrong so they have to correct you. Look at arrows on a clock. Please ensure that your child has appropriate summer kit as it is getting warmer as I don’t want children to overheat in tracksuits. This will also be needed for sports day, including appropriate footwear for grass. Children have continual access to the outside area so please ensure that sun cream is applied daily and that your child brings a named hat to school. If children do not have sun cream on, I will have to limit their outdoor time to ensure they are safe. Please can I also ask that a water bottle is brought in daily as many children do not have them? Every year the Year 6 cohort organise a talent show. We will be holding in class auditions to see which act will perform in the show in the last few weeks of school. If you want to start practicing and putting together an act then this would be fantastic. We won last year so I want some very creative performances…no pressure parents! I will let you know when the in class auditions are so that costumes and props can be brought in. The PTA have been busy organising the summer BBQ for Saturday14th July at 3pm until 5pm. It would be lovely to see lots of you there. We will be encouraging children to ‘always say please and thank you’ as often these can be easily forgotten. There will be no show and tell this half term as it will be a little difficult to fit this in with transition, sports day and the other busy things we have planned. If there is anything that your child wants to show me, then please take a photo and pop it on Orbit. I hope you had a lovely break and feel refreshed and ready for another busy half term in the run up to Easter! Last half term the children really enjoyed exploring different occupations and really developed their passion for knowledge as they continually asked questions to find out more about the different roles we have in the community. In Spring 2 our topic is ‘Superkids’, where we will focus on fictional texts and use ‘Talk 4 Writing’ to explore characters in stories. The story we will base this around is ‘Supertato’ which is a very comical narrative which I think the children will enjoy. As you have seen, there has been a superhero invasion in our classroom! It appears that evil Pea is trying to recruit other baddies, so we will unite and learn how to be goodies, like Supertato, to defeat him! We will be looking at all of the characteristics that these superheroes need as well as their unique features so that the children can create their own superhero identity. We will then put together our costumes and superpowers to come together for a fashion show which you will be invited to. More details on this will follow in a few weeks. Towards the end of the term we will also look at Easter and the celebrations surrounding this time. We will begin by learning about Shrove Tuesday, where we will make our own tasty pancakes, before competing in a pancake race! The children will then explore the Easter story and take part in some familiar customs such as making chocolate nests, decorating Easter eggs and going on an egg hunt. Some of the class has now finished Phase 3 and are starting on Phase 4. In this phase the children won’t learn any new sounds, but they will be learning how to use the sounds to write CVCC words and polysyllabic words (words with more than one syllable) such as farmyard. Some of the class will be recapping the phase 3 sounds to help to consolidate their learning as some of the trigraphs ( 3 letter sounds eg ‘igh’) are a little difficult to remember. Any work you can do with them at home to help those who may need a little extra support would really help your child to become more confident in this. Phase 4 Phonic book marks have also been sent home this week, please keep using these when reading with your child to help them develop their sound and tricky word recognition. The children have shocked me with their progress in reading last half term with many of them confident in sight reading common words as well as those that are tricky. We have started guided reading which is building on the children’s comprehension skills as well as their actual reading ability. We do this through ‘clarifying’ words which they may not know the meaning of, and asking them to ‘summarise’ pages they have read and draw conclusions from both text and images, Reading books will continue to be changed on a Monday as it allows enough time to revisit the text a number of times to build the children’s comprehension skills as well as their reading. I have had a number of parents concerned that their child is a little reluctant to read at home. This is very common however it is vital that you try to entice them to do so to continue their development and try to create a love of reading as reading is the foundation of all learning in Early Years. There are many ways you can do this without them knowing, for example get them to choose a reading buddy. This is a toy which is only allowed to come out if they child reads to that toy, then they can play with it for a short while afterwards. Encourage them to read to their pets, siblings or even a group of teddies. Use the torches we gave you at Christmas. Try asking them to read each page in a funny voice. You could even act out the pages when their have read it. The more fun, energetic and discrete you make it, the more they will want to do! In our Literacy lessons, the children will continue applying their learning from our daily Letters & Sounds sessions through a guided literacy activity once a week and then independently during the Wonderful Writing task. This half term will focus on using dazzling describing words to define characters, write letters to superheroes and create a cunning name for their heroes. Most children have grown in confidence greatly with their writing and are enthusiastic about doing it to a high standard. It is lovely to see them beaming with pride when they have completed it and remembered all of the key features such as capital letters and finger spaces. I can see those who complete their home learning tasks regularly and with little support are absolutely flying with their writing, so thank you so much for supporting their learning at home. I have included below some examples of the writing to show where I would expect children to be at this time in the school year. If you think your child finds certain elements of writing difficult then please come and see me and we can support them with this together. We will be focusing on the number again this half term, this time exploring problem solving. This will look at adding totals, subtracting, doubling and halving. They will also continue to look at ordering numbers to 20 or beyond as well as one more than and one less any given number. Some children are finding the numbers 12,13,14 and 15 difficult to remember when counting or ordering so this will be the main focus with starters during lessons as well as with home learning tasks set. Sharing out food between you and your child, showing them that you must both have the same. Start by counting out your starting total and then giving “one for you and one for me” until you have equal amounts before reinforcing that half of your starting number is what you have in your pile. Double the spots on a ladybird’s wing, emphasising that when we double it has to be the same number on each side before they want to be friends and counted together. Doubling the total number of their favourite food! Looking at and drawing the symbols for add, subtract and equals. Most children are now on Passport 2 (orange) and will be focusing on the targets ‘saying sorry when I have done something wrong’ and also ‘comforting others when they are upset.’ Those still on Passport 1 will have individual targets as there are only one or two stopping them from moving onto Orange. Thank you to Mrs Osbourne and Mrs Young who are helping with readers. It helps the children so much when they read to varied audiences. Some names have worn out of PE kits so please can you check that names are visible as there has been numerous things lost or misplaced when getting changed. Also a big thank you to those who have been supplying our junk modelling table with lots of goodies, the children have loved getting extra creative with these. Thank you for putting so much effort into show and tell with your children. It is lovely to see how confident they are talking in front of each other and asking questions well thought out questions. I hope you had a lovely Christmas and wish you all a Happy New Year. I am extremely proud of the children for their enthusiasm and confidence during the Nativity play, they all tried exceptionally hard in front of some very large audiences. We hope you enjoyed it also. This half term our topic is ‘Real Life Superheroes.’ Here the children will explore lots of different occupations and discover their roles in helping us with day to day tasks. We will split the topic into areas such as People who help us; at home, at school, stay healthy, get food and keep safe. In the final week of this topic we will then look at what the children would like to be when they grow up! This will be celebrated with a “When I grow up” dress up day where the children will be invited to dress up as the occupation they would like to do when they grow up. I am also looking to invite people of different occupations in to class in order to talk about their roles and develop the children’s questioning skills, if you would like to come in and talk about your profession then please let me know. We will be focusing on looking at non-fiction texts this half-term. Here we will be exploring how these differ from picture books and identifying some of their key features. We will also include the talk4writing practice that some of you witnessed on the video posted on Class Dojo of our rendition of Jack and The Beanstalk. This encourages children to organise facts as well as recognise language used when writing them down. The children will be encouraged to use full sentences when writing and break their flow of speech into words. We will be looking for them to use capital letters, finger spaces and full stops, so any support at home with this would be very useful. The children will be given a range of opportunities to utilise these skills this half term with different activities such as creating posters to promote helpfulness at school or writing about what a doctor might need in their bag. 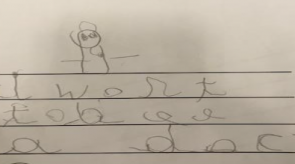 The children will also be completing a weekly independent writing activity to further develop their confidence to form sentences and words using their own knowledge as some of the children have become extremely reliable on adult presence when writing, and are reluctant to have a go. We have tried this out last term and it has been extremely successful and the progress made already has been amazing. We are continuing with Phase 3 of letters and sounds this half term where children will continue to pick up new digraphs (2 letters which make one sound eg ai as in r/ai/n .) They will also be introduced to trigraphs, (3 letters which make 1 sound eg igh as in t/ight/t) new tricky and HFW and also encourage the blending and segmenting of CVCC words (as in frog). It is vital that children practice their reading and writing at home as well as school as it consolidates their understanding and also heightens their confidence. Also please may I express the importance of letting the children use their robot talk to isolate each sound in a word independently, and not being given a word to copy as this makes them reluctant to have a go on their own and hinders their progress. I can often tell which children are reliant on their parents for this when it comes to writing in school. Please can I also encourage the use of cursive letters in all writing otherwise it will confuse children in the future if they are swapping. It has been lovely to see how many children have embraced the adventure bear writing book when they are the superstar and have to look after the bears for a week and record what they have been up to at your home. Shape will be our focus this half term where the children will be looking at repeating patterns first, before moving into identifying 2d and 3d shapes and their properties. Although main teaching and activities will have this focus, we will still incorporate daily number starters and focus on this in Friday maths lessons to ensure the children’s number sense continues to develop. To support your child in this area you could begin to look at shapes in the environment and allow them to play and construct with various shaped items to make images and models to develop their understanding of tessellation and edges. Please note I will be using the term ‘rectangle’ and not oblong, due to recent studies suggesting this is the correct name for this shape! Children are making great progress in completing their passport targets. Most children have completed Passport 1 and will now move onto Passport 2. We will be focusing on ‘solving a problem without arguing’ this half term and try and encourage children to use communication and kind gestures to keep play going when challenges may occur. Many parents have now joined orbit which is lovely. Please feel free to add your own photos to showcase what they are getting up to at home and their out of school achievements. There was some feedback on the questionnaires at parents evening in regard to the appropriateness of the homework sent home. Many of this was extremely positive, however there was a small number that suggested it was difficult to complete with their child. The homework is an extension to what they have learnt at school and should take 10-15 minutes per activity to complete if you choose to complete it as it is not compulsory. If you do find that it becomes a bit of a battle then try to encourage them to do a little bit of it if they are willing. I know it can be tough at times, however when learning becomes a collaboration between home and school, children do often become far more confident in their learning and gain independence when doing so. Emotional development- “Many boys have difficulty naming and expressing their own feelings. Sometimes they just know they don’t feel quite right. Some boys don’t have the words to identify the feeling of being sad, cross, scared or worried. Therefore it is vitally important that we help boys to understand and express their emotions. Sometimes boys can find it difficult to read non-verbal cues and may respond inappropriately.” – Gary Wilson. With this in mind we have been trying to develop the children’s understanding and expression of their feelings as without the ability to do so, they often will have difficulty empathising and building relationships with others. I have included some more information about emotional development towards the end of this newsletter. PE will continue to be on Mondays and Thursdays. We will be inviting you in to hear a song we will be learning to celebrate ‘people who help us.’ This will be on the same date as the dress up day, just before home time. Dates will be confirmed in the next week for this. Thank you to Mrs Osborne for reading with the children this half term, I know there was some interest at the start of the school year with others also helping with this, if you are still wanting to then please let me know. The reading demonstration will take place on the 3 dates supplied to those who responded to the original letter showing interest to see how we teach reading in Reception. This will be a phonics lesson to help you with reading and writing techniques used in class. If you have any questions about anything in this letter then please do not hesitate to ask. I look forward to another fun filled half term. 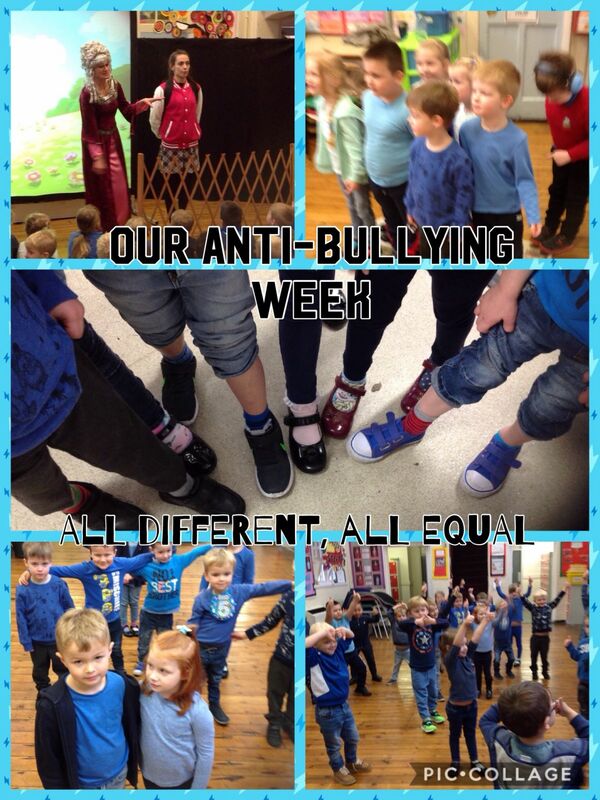 We had great fun exploring anti-bullying in a week full of fun activities and workshops which focuses on this years theme; all different, all equal. We particularly enjoyed the show we got to watch as well as making bunting to hang in the hall. Welcome back to school, I hope you had a restful break after such a busy but fantastic first half term. I am extremely pleased with how the children are settling in and can already see some brilliant progress as they embrace all the new topics and learning concepts I keep sending their way. Autumn 2 is going to be another action packed half term, particularly with all the celebrations in the run up to Christmas which is always an extremely exciting time of year. I just wanted to say thank you to all of those that attended the Family Tea party the last week of term. This was a huge success and the children seemed so pleased to show the adults the classroom as well as spend some quality time together celebrating their unique families. I have included a little questionnaire at the bottom of the newsletter to help you process some of the important information in this letter. Sometimes with hectic lives I know it is hard to take the time to read letters such as this, however it is recommended you do so. If you complete the 3 questions with answers found in the text and hand it in, I will instantly put your name in the parents reading raffle draw for a chance to win this half terms prize. This half term we will be looking at Traditional Tales. We will be focusing on exploring the language included in these books, different character roles and beginning to learn how we can be authors to and change elements of a story ourselves. We will also be learning about celebrations and family traditions such as Diwali, Firework night and Christmas. To help your children develop in this area it would be great to share some of your favourite traditional tales as well as the more modern ‘messed up fairy tales’ which often tell the stories from a different perspective. This will help extend the children’s vocabulary even further and also explore the concept of differing narratives. The children are rapidly picking up each new sound introduced as well as the skills needed to read and write words and captions. Due to their hard work, we will be finishing Phase 2 in the first week back and then move onto Phase 3 where more sounds will be introduced as well as high frequency words(HFW) and common exception words (Tricky words.) New bookmarks will be coming home with your child. If you could attach these to the others on your reading log then this would be great. I hope you have found the video I have recently shared on the Class Dojo page as well as the Facebook group which showcases how we teach and develop reading skills in Reception. I have had a few parents say that their child is a little reluctant to read at home. This could be due to a number of things such as time of day, lack of understanding of the narrative so it therefore becomes boring, or un-engagement. To try and help with these issues I would firstly suggest picking the reading time according to your child’s mood. If you know your chid is more responsive in the mornings, try and have a morning cuddle and spend 5-10 minutes reading before the morning kicks in. In order to hook the child into the narrative and also help them learn how to understand these through the use of pictures and text you could first act out what you think will happen using the pictures to help before ‘being a detective’ and actually reading the story to see if they were correct. Literacy will focus on encouraging children to use their phonic knowledge to segment words to build sentences with less adult support as previously needed due to the majority showing great understanding of how to use skills taught in phonics lessons to do this. We will also be using ‘talk 4 writing’ methods to look at Jack and the Beanstalk. I will be inviting parents in to school at the end of November at 9.00- 9.45 to see how talk 4 writing is used to develop children’s language and understanding of features of a book. This will give you insight into little activities that can be done at home to help develop these further. I will also be showing you how we encourage children to write independently, without copying words and going over dots to help them grow into independent writers. I will send out more information about this in the next few days so that you can re-schedule prior commitments to attend. This half term we will continue to focus on number work. This includes recognising numerals to 20 (or beyond), counting accurately and matching totals to a number, adding 1 more than to a number, estimating totals with realistic answers. We will also be introducing combining groups to find the total (simple addition) and then recording this using the plus symbol. Finally in week 7 we will be beginning to look at simple patterns, ready to lead us to shape in the Spring term. Any additional number learning at home will benefit your child’s number sense. Your children have really enjoyed some of the number songs I have introduced so I have included links to these below. 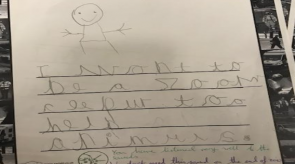 Song to 100- https://www.youtube.com/watch?v=e0dJWfQHF8Y I have noticed that there are some children who have come to school lacking any number knowledge or number sense making it difficult to recognise numbers 1-10 and count out totals to match each numeral. Any additional practice at home would help develop these skills quickly. The response to the writing home learning activities will continue over Autumn 2 and I will now include a maths activity linked to what we have been learning in school. It has been fantastic to see how many children get excited about this weekly and I see a huge difference in the children who complete it regularly. May I remind you it is not compulsory, however strongly recommended that this is completed as again it consolidates skills and builds independence. This has really helped the children learn to write their names with the majority conducting it daily so well dome to those who have kept at it. I am going to change this for Autumn 2. Now I will be putting a simple picture up with a phoneme frame underneath to show how many sounds are in it and your child will have the write the word on a post it note. This will help them develop their segmenting skills. You may need to help the child repeat the word in robot talk to distinguish all 3 sounds in each word but please refrain from just telling them the sounds. I will get a video up to show you how I encourage this at school. I hope that the information given out in regard to independence was helpful last half term. I have included two more information sheets about how to support early literacy development with a little questionnaire to help you asses the level that your child is at currently and some ideas to further support them. Please note it does state on it that ‘too much pressure at an early age can create literacy difficulties.’ This is extremely important as pressure can lead to low self-esteem and also reluctance. This doesn’t mean you give up trying if your child is a little reluctant, it means you try new strategies to engage them. I have also included some maths ideas for home. Again these are not focused solely on boys and would be very useful for both genders learning development. As of this half term I will be introducing the ‘Bear Adventures Book.’ The child who receives the star award on a Monday will get to take home a little box with 2 bear dolls in and a selection of clothes. Your child will then have to dress them appropriately (independently to help fine motor development) and take them on an adventure. They will then draw a picture of the bears or take a photo and write a sentence showing what they have been up to for the week. This only has to be one page, however if you would like to complete more that is fine. The bears will be sent home on a Monday and returned the following Monday, allowing you enough time to complete it. Please be aware I am not looking for correctly spelt sentences as the children are not at this stage and this is a clear indicator that lots of adult input has been given. I am looking for children to sound out words using their phonics, however they may need you to repeat the words to do so and also reminding of what these sounds look like by pointing them out on the alphabet mats sent home. I look forward to seeing what the bears get up to when in your care. I know it is hard to try and put a stop to comforts such as this, especially when they are experiencing so many new things with the transition to school, however I know you all want the best for your little ones and would hate to know that something you are encouraging could potentially have negative long term effects for your children. Help your child accept the dummy has gone by telling them they are a big boy/girl now and they could leave it under their pillow for the dummy fairy or encourage them to put in in the bin. Don’t try to remove the dummy whilst the child is experiencing other changes eg a new sibling, starting nursery etc. Any reply slips or notes in book bags may get missed as we sometimes do not get the opportunity to check them. With this in mind, please hand all slips to the class teacher. If your child is being brought to school by an out of school club or child minder, please pass the slip to them so that they can hand it to us. Orbit- There has been a delay in setting up the online learning journey however it should be up and running in the next few weeks and you should be able to see some photos of what your children have been up to. Class Dojo- There has been a wonderful response to the launch of this, with only a small number of parents not joined. Thank you for your excitement with it and I hope it becomes a useful means of communication. I look forward to seeing you all at parents evening over the next couple of weeks, please remember these are limited to 10 minutes per appointment, if you need any additional time to discuss things, please book another time to see me. On Friday 29th October we had a wonderfully active day in aid of Stand Up Bolsover. We started the day with a wake and shake where we practiced some dance moves before going on a number hunt outside around the school and seeing what we could find. After that we had discovery time and had fun playing inside and outside the classroom where we rarely sit still anyway. 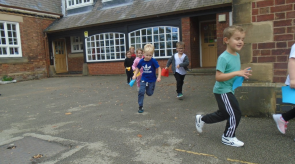 We also took part in the Golden Mile, running around the playground as many times as we could to get a stamp on our card. After all of this excitement we were very tired, but had just enough energy to play musical statues! It is a huge honour to welcome all the children and parents to Reception, with a special welcome to the new children and families to the Barlborough family. I am very much looking forward to getting to know each and every one of you, along with your little ones. The main priority in these first few weeks is to support the children as they transition into school life and make them feel comfortable and safe as they settle in to their new environment. This newsletter gives you some insight into your child’s day and what to expect from this half term to help ease you into the routines and structures of the school. In order to help your children settle down quickly in the morning, as well as begin to gain independence, there are a number of tasks we ask your child to do every morning. They may need a little support at first however by the end of this half term they should be performing these independently. When entering the cloak room please encourage your children to find and recognise their name, this will help them learn the letters that make it up and therefore distinguish it from others in other contexts such as on book bags, PE bags and cardigans/ jumper. Book bags will go in the grey box on the shelf by the door of the cloakroom (this is labelled) and lunch boxes in the one underneath. Above their pegs there will be a post-it note, please ask your child to write their name on this before sticking this onto the wall opposite the office door informing us if your child is having a school dinner or a packed lunch. This encourages the children with their name writing, pencil grip and again encourages them to take initiative. They can enter the classroom to write their name, however pencils will be placed on the windows. Upon entering the classroom, please ask the children to put their water bottles in the green trays which are located by the sink. This gives them continuous access to water throughout the day. Please note it is only water that is acceptable in school, any juice will be replaced with water. At 9.00 I will call all of the children to the carpet, if parents could make a swift exit from the classroom so we can start our busy day this would be greatly appreciated. Our topic for this half term is ‘Marvellous Me’ where the children will explore lots of different and unique ways which make them special. Here we will explore their original features, their interests and unique characteristics. This will then lead onto learning about families and how they differ from one another. Finally we will explore the amazing human body and why it is important to stay healthy. We will be celebrating our wonderful families with a tea party towards the end of the term where parents will be invited to come in and participate in activities with your child which promote the unique nature of every family. This is often a very popular event, so please look out for the letter in the next few weeks and reply promptly as it will operate on a first come, first served basis. As phonics begins I will be sending home handwriting practice sheets. These will be send out on Thursdays and should be returned the following Wednesday. Please note that we teach the children to write with a pre-cursive formation and this should be continued at home as going between writing styles could confuse your children as well as delay their development in writing. It can be a little confusing at first and may make your child’s handwriting appear messy, however it is essential that you continue to practice it this way. Please refer to the videos above or the handwriting booklet sent home in your transition packs. Every half term we celebrate an ‘Amazing Author’ where we explore lots of their books and use these as a link to our topics and Literacy objectives. This half term we are looking at Liz Pichon. As we begin Phonics it is important that your child discovers the sounds they hear and see at school in various contexts, we will therefore be sending home a school reading scheme book that you can share with your child. At this age, reading is a crucial part of children’s learning so it would be helpful if you could hear your child read at home as often as possible and ask them questions about the story to develop their comprehension skills. I will send home an information leaflet about this along with your child’s first book for some guidance. Your child will also have a Reading Diary for you to date and sign each time you hear them read. You can also use the diary for any informal messages you have to pass on. Please be aware every child is different and they all progress at different rates. However, if you have any concerns over your child’s reading development, please see one of us. In the meantime, please continue to read to your child as much as possible. The picture books outside the classroom can be borrowed for you to share with your children. Please sign these out and upon returning them. As an incentive to try and encourage children to want to read when at home we have set up a reading reward system. Every time your child reads for 10 minutes or more and you have recorded this in your child’s reading record then you can place a sticker on your child’s named book spine located in the school corridor. We will then total up the additions every week and choose a star reader (or readers) who has read the most times. A raffle ticket will then be sent home to the parents of the star reader as a thank you for encouraging your child to develop their reading at home. There will then be a prize draw at the end of the half term where a name will be picked out of a hat and a prize for the adults will be sent home. Along with this children who have read a minimum of 3 times a week will also get a certificate and a prize. Please note that we will check reading records weekly to ensure that comments match the total number of stars on the spines and we will remove any that are not recorded. We use an online learning journal to document all of your children’s achievements. It also allows you to see what your child is up to at school as well as input ‘wow’ moments your child has at home for us to see. To link you to your child please complete the form below with your email address which will then send you information about the next steps and how to access your child’s journal. Please ensure you do not share any information from your child’s journal on social media sites as there may be references and photos of other children due to group work. We have a large amount of boys in this year’s cohort and it is common knowledge that boys often have a completely different approach to learning than girls. Although this comes with it many positives, it has also created a global problem where girls can be seen out performing boys throughout their whole school life. With this in mind it is absolutely crucial that we work together to try and engage both the girls and boys in the class and create that love of learning from the outset. It appears that independence is key when it comes to boys learning and I will be sending home some activities to all students which are designed to encourage independence in thought processes as well as when involved in tasks. I will also be sending home information by Gary Wilson who has published many books to help practitioners and parents nurture boys and build them to be successful learners. I have a fantastic book by him for parents called ‘help your boys succeed-The essential guide for parents.’ I would strongly recommend for parents to purchase this, or am happy to lend my copy out if you are interested in reading it. I have included an information sheet at the end of this newsletter about your child’s independence and ideas on how to build on this as well as some early literacy ideas to help both girls and boys discretely with essential skills needed to write successfully. It is completely normal for children to get upset when you first start dropping them off at school, especially when they are not used to the new routine and structure that they are experiencing. In order to help upset children it is vital that we work together. It is best in these situations that you leave the class quickly as this makes the anticipation of you leaving less intense. In some circumstances children will latch on to you, making it difficult for you to leave, in these cases I will always ask your permission before I intervene. Next I will ask that you give them a kiss and a cuddle before you leave. I will then take your child from you calmly and gently and comfort them until they calm down. Often they take very little time to settle and we will always contact you to assure you that they are ok, likewise you are welcome to ring the office if you are concerned as I understand that it can be very upsetting for you too. If your child isn’t clingy, yet still upset, allowing you to leave easily, please make a member of staff aware as some children will then try and follow you. We will be concentrating on the three in bold this half term and discuss these topics during circle times. We will have PE twice a week. Please can you ensure your child has their P.E kit in school on these days and that they are not wearing any jewellery (should your child have recently had their ears pierced you must send them to school with earrings taped up on these days.) 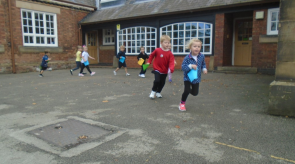 As the weather turns colder it would be useful if your child could have long trousers and a jumper for our outdoor sessions as well as their t-shirt, shorts & plimsolls for indoor PE. Please look out for First Aid letters which children will be given at home time if they have had an accident at school. This gives you information about what minor injury your child received and how/when. These will be on red paper if it is a head injury. Please be assured that if any accidents happen which we deem of a more serious nature we will contact you immediately. Each term, our class newsletter is available to read on the school website. We are always looking to collect recyclable materials to use to make models. If you have any that you could donate, please ensure it is clean and place it in the junk modelling box at the creative table. We are always looking to have adult helpers involved in our school. If you would like to help out in our class as well as other year groups, please let me know and I will pass your information on to the office. It is important that your child begins to develop their independence in order to undergo day to day school life confidently. With this in mind we ask you to support your child in practicing certain skills at home such as getting dressed and undressed, taking their jumper off and putting it on, recognising their name, putting their coats on and tidying away what they have been using before moving on to something else! It is recommended that a pair of named wellies are kept on each child’s peg for outdoor learning as it moves into Autumn as we will be out come rain or shine! Mrs Attia will lead the class on Tuesday afternoons as it is my allocated planning time. Please ensure all clothes (including PE kits) are named as things will go missing and we are always eager to reunite it with its owner. Please ensure that your child does not go on the play equipment in the main playground or Reception outside area before or after school. If you have any questions about any of the above or any other queries please do not hesitate in speaking to Miss Heath-Smith, Mrs Attia or I, we are always happy to help.